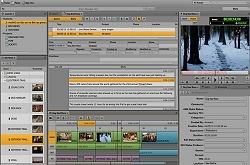 AVID and Al Jazeera sign newsroom agreement. Massachusetts, USA, January 2017: Avid® has announced it has signed a major framework agreement with Al Jazeera Media Network including a Global Services Agreement and Global Product Call-off Agreement. These agreements further cement the companies’ ongoing strategic relationship and enhances Al Jazeera’s significant investment in Avid’s comprehensive tools and workflow solutions to create, distribute and optimize media for its end-to-end news production infrastructure around the world.